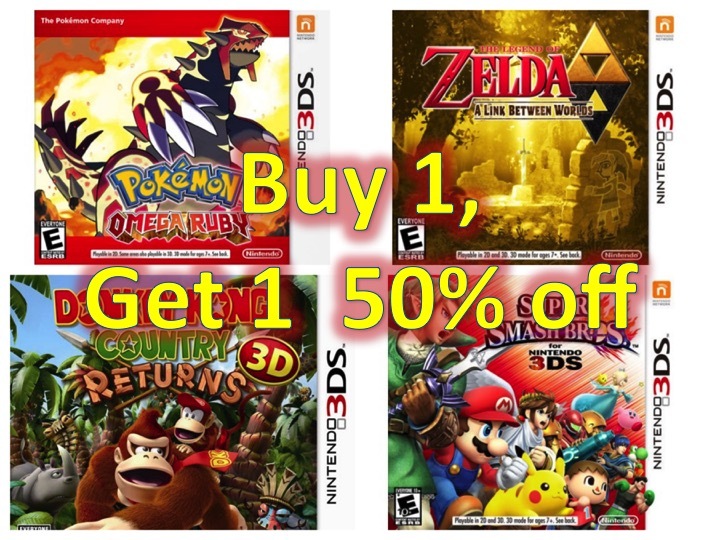 Nintendo 3DS (XL and new) Games – Buy 1 Get 1 50% off! You are at:Home»DEALS»Nintendo 3DS (XL and new) Games – Buy 1 Get 1 50% off! For a limited time, Best Buy is offering Buy 1, Get 50% off the 2nd game from a selection of Nintendo 3DS games – added bonus Best Buy Gamers Club Unlocked. The sale includes awesome games such as Super Smash Bros., The Legend of Zelda: A Link Between Worlds, Xenoblade Chronicles 3D, and classics such as Animal Crossing: New Leaf. Some games are priced $29.99 and some are priced $39.99, you will receive the half off discount on the lower priced game! Which games are you interested in getting? Tweet us @AsianGeekSquad.